Beloved and I had lunch at Shao Kao Grillery the day after visiting Cow Wow, more than a month ago (yes, delayed because of my Sendai/Japan Odyssey). This semi-open place serves grilled foods, and, based on its name, still be somehow Chinese. I’ve already happened to pass by this place a lot of times already, but never dared to try it. After learning that it’s got quite favorable reviews, including a recommendation from MIL, we decided to try it out. I actually found it strange that there’s a “Chinese Grillery”, as whenever I hear “Chinese”, I’d usually think of dimsum and noodles and other common Chinese dishes you can cook on a wok. These usuals were not present here, and their selection is basically an assortment of grillable meats and veggies. To order, you go to the counter where it featured a couple of blackboards with the available meats and veggies for grilling. While there are premium options that are quite expensive like U.S./N.Z. Angus rib-eye steaks, there were also a lot of more affordable meats. Similarly, their veggies seemed to be priced quite fairly, at least on the chalkboard. Anyway, we ordered an assortment of vegetables, basically going down through their list of available and ordering what we know we’d like: Broccoli (30 Php), Sitaw (16 Php), Pechay (20 Php), two orders of Tomato (16 Php ea. ), two orders of White Onion (25 Php ea. 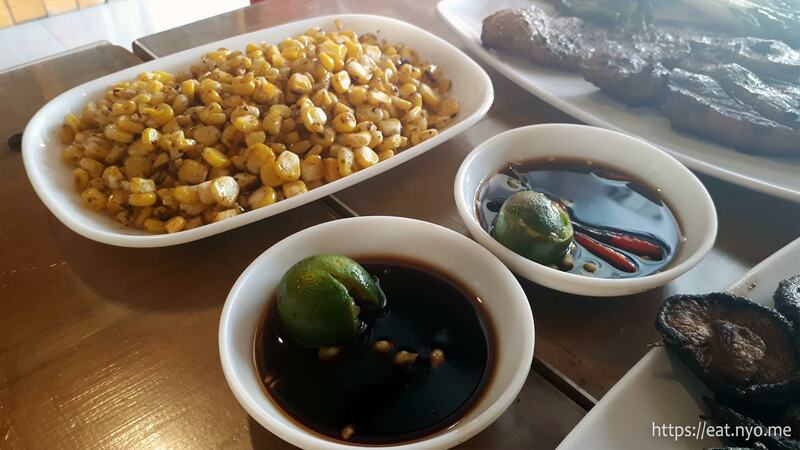 ), Sweet Corn (45 Php), two orders of Shiitake Mushroom (40 Php ea. ), and Squash (30 Php). 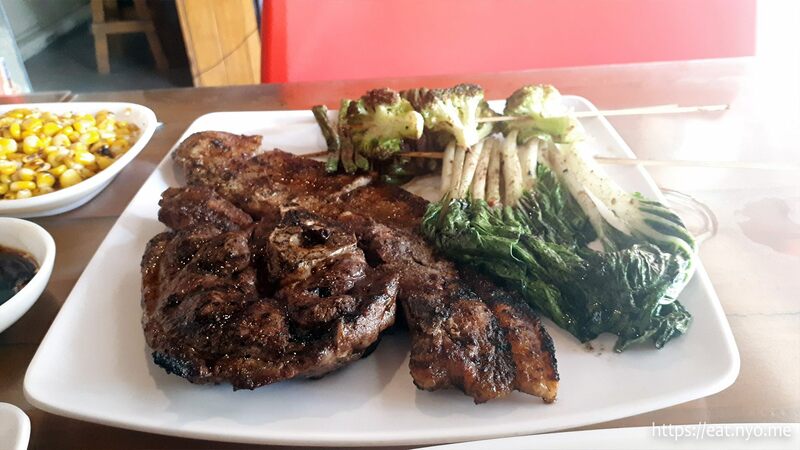 For protein, we got their Liempo (110 Php) and Lamb Leg Chop (160 Php). Finally, we also got two orders of their Chinese Tofu (16 Php ea.) and two orders of Rice (16 Php ea.). Our orders arrived all at once in multiple plates. Since there’s a lot, I’ll not go through detail on everything, just those that stand out. For the meat, their Liempo had the expected fatty part and slightly leaner but still soft and juicy meat. It’s not really a standout from what I’ve had before, but I’d admit that it’s generously and appropriately sized for the price. The Lamb Leg Chop was much more lean, hence, much more chewy, but still tasted quite good. Whatever seasoning and oil they used in their grillables did their job well. If I had to guess, I think it was sesame oil with salt and pepper and maybe MSG. Even though the seasoning was probably the same use for all their meats and vegetables, it removed most of the acrid properties of the original ingredient while heightening the more pleasant flavors. For example, the White Onions didn’t have the usual astringency, and instead were quite sweet. The Pechay had all its bitterness removed from their stalks. Other standouts from the veggies include the Shiitake Mushrooms and Tomatoes, the former being just meaty by default and the latter popping an amazing burst of flavor juice in your mouth as you bite. Oh, and the Chinese Tofu amazingly kept a firm body and absorbed the seasoning and sauces. Speaking of sauces, they have a self-service section for their sauces, where you can concoct your own dipping sauce, in case you grow tired of the monotonous seasoning and natural flavors. Nothing fancy here, just your usual soy sauce, vinegar, chilies, and calamansi. Oh, and you can have the Sweet Corn on the cob or have it shredded, as we did. Honestly, I shouldn’t have ordered rice and just had this as my staple instead. And we didn’t wait long—we went back here a week later. This time, we ordered again their Pechay, White Onions, Tomatoes, Chinese Tofu, and Shiitake Mushrooms; basically favorites from our last visit. 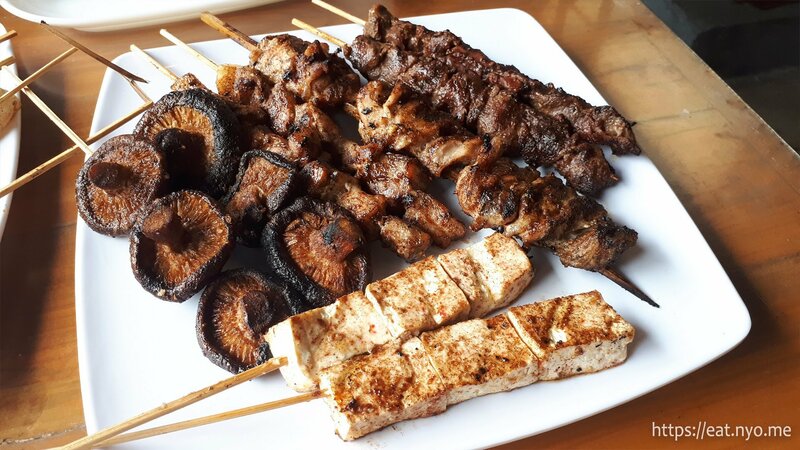 We changed it up in the protein side by ordering their Boneless Chicken (85 Php), two sticks of Pork BBQ (30 Php), and an order of Lamb Kebab (130 Php), the last having two sticks per order. Finally, I also ordered some new veggies out of curiousity: Romaine Lettuce (30 Php) and Cabbage. Oh, and we got rice again. This time around, we enjoyed our meats more than the last time. Their Boneless Chicken, while didn’t have the skin on, was still quite juicy and cooked through nicely. I also enjoyed their Pork BBQ which was similar to most Filipino-style barbecues I’ve tried before. Finally, the Lamb Kebab was much better than the lamb chop, being a bit less chewy and, perhaps since it has a bit more surface area, had a lot more charred parts that took in more flavor. Surprisingly, I have to add the grilled Cabbage to my list of favorite-veggies-to-grill. Since it has a lot of leaves, hence a lot of surface area “traps”, it was able to be a vessel for the delicious seasoning they use. I’ve had grilled Romaine Lettuce before, so I already know it’s going to be good. They were also able to consistently reproduce the same delicious experience in the other veggies and tofu we already got before. Again, I have to emphasize that there’s a “default” grilled flavor for all of their food, carried by whatever oil/seasoning mixture they use. 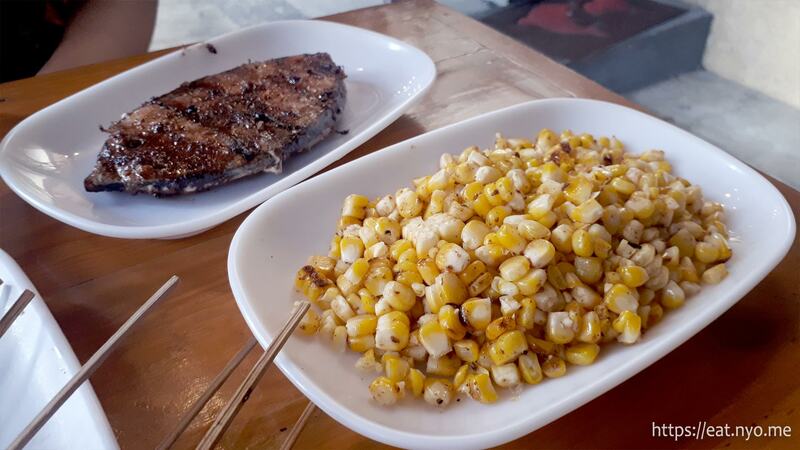 However, this default flavor was very well balanced and not at all too salty or too peppery, improving the natural tastes of the meats and veggies. If you want to make them more salty/spicy/acidic/citrusy, make use of the available condiments. Finally, well, at least for this article, we went back again a couple of weeks ago due to cravings for veggies. This time, their Tanigue (160 Php) was available, so we decided to order that. Also, since some of their other meats were unavailable, we decided to splurge a bit and get their N.Z. 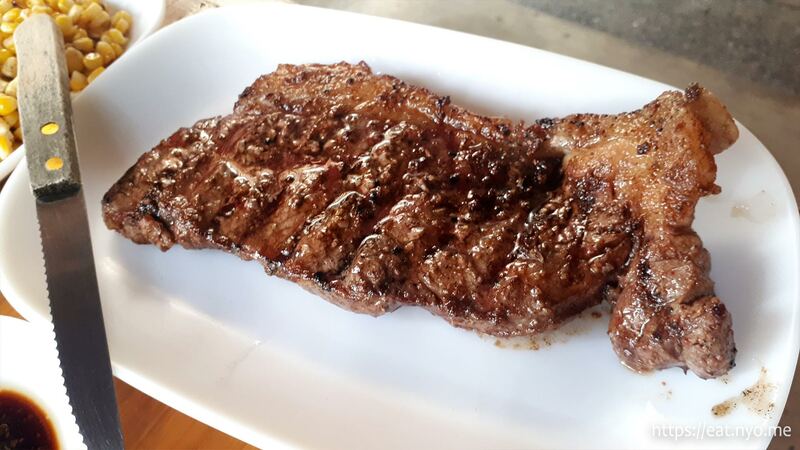 Angus Striploin Steak (395 Php). For the veggies, we didn’t really get anything new and I’ll let you decipher from the image above. The grilled Tanigue steak, while relatively plenty, wasn’t as good as Beloved would’ve liked. It’s a bit on the dry side, but it’s expected, I thought, due to the nature of cooking. Honestly, it’s still a teensy bit moist and flaky, so it satisfied me, albeit just barely. The seasoning didn’t add much to the fishmeat taste, but the sauces allowed for the usual toyomansi flavor. Finally, the N.Z. Angus Striploin Steak was okay. It had a nice amount of fat, so it was still quite juicy, and it was cooked just right for us—medium rare. The seasoning didn’t make it salty or peppery at all, like our fish, and highlighted its meatiness and juiciness. Perhaps the only complaint is the fat could’ve used a bit more charring. Also, I can’t really tell how this is “New Zealand” compared to other steaks I’ve been trying recently, but, hey, maybe some people can tell. This round’s total bill was our most expensive, and yet, it only managed to scrape 800 Php. Considering we got an almost 400 Php steak, this was still one of the better value meals among the places we’ve tried recently. We eventually learn that “Shaokao” literally means “barbecue” in Chinese. As I enjoy barbecue by default and somehow Beloved also enjoyed this particular place, we have found a place to frequent in Shao Kao Grillery. Our bills averaged 750 Php even if you count the splurging on our third visit, and we always managed to eat quite a lot. This is actually pretty good value that I can see people frequenting this place. In fact, I think there was another couple who have already made it a tradition to go here every week, as I noticed they were present the first time we went as well as the second. I believe they’ve been regulars for quite a long time already as they also ordered some food to-go. 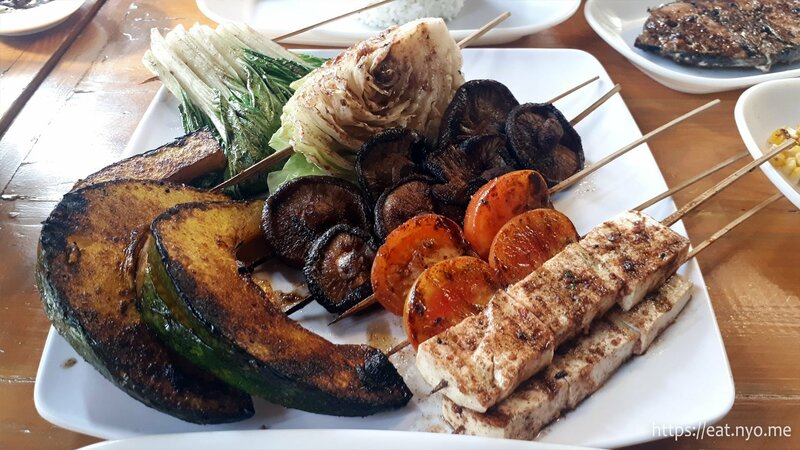 I also like the fact that I can actually recommend this place even to my non-carnivorous friends, as their grilled veggies and tofu were quite delicious as well. Finally, their steak (the one we tried) was pretty good too and perhaps this can be a good place to even splurge on steak sometimes (although we prefer their other offerings). 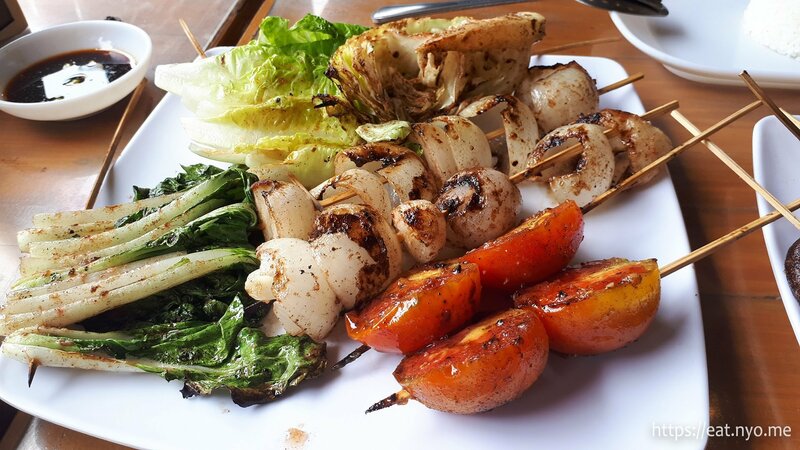 If you enjoy grilled food, Shao Kao is a definite must try. 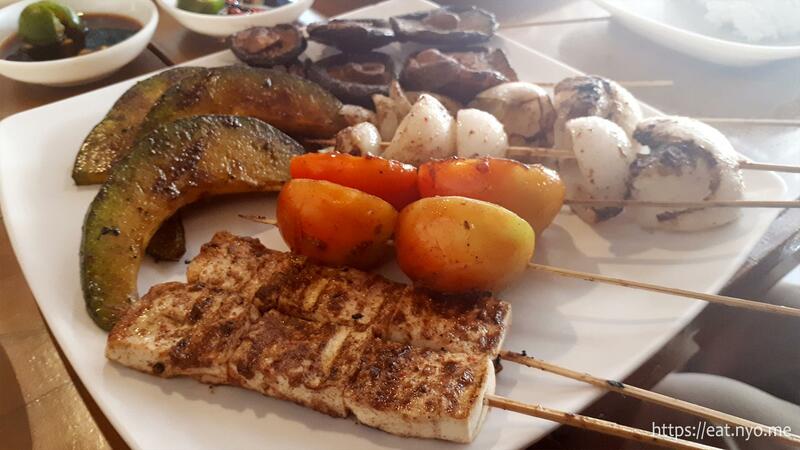 Recommended for: Grilled food lovers. Not recommended for: Grilled food haters. Smart nomnomnom tip: Dip your veggies and/or rice to your protein drippings.